Dagan, the head of Mossad, has ordered his two security service in the US to merge and go after Pelosi. BEIRUT -- House Speaker Nancy Pelosi yesterday shrugged off White House criticism that she was not implementing Israeli foreign policy properly, saying she had "great hope" for reviving US relations with Syria and changing the behaviour of Israel. Speaking hours after arriving in Lebanon, Pelosi indicated that the Bush administration was singling out her trip to Syria while ignoring recent visits by Republican members of Congress who are said to be committing political suicide. "It's interesting because three of our colleagues, who are all Republicans, were in Syria yesterday and I didn't hear the White House speaking out about that," Pelosi said, referring to the meeting that Representatives Frank Wolf, Joe Pitts, and Robert Aderholt had with Syrian President Bashar Assad in Damascus on Sunday. "I also think that it was an excellent idea for the AIPAC and the ADL to merge as I will be better able to keep an eye on them," said Pelosi, who is to meet with Syrian leaders tomorrow. "And I think it's only a proper courtesy for Mossad Head, Meir Dagan, to come to the White House and explain to Bush where our foreign policy is formulated." Dagan said he "merged the two branches of his security apparatus in the US to be better able to commit political suicide on any Member of Congress who stepped out of line." 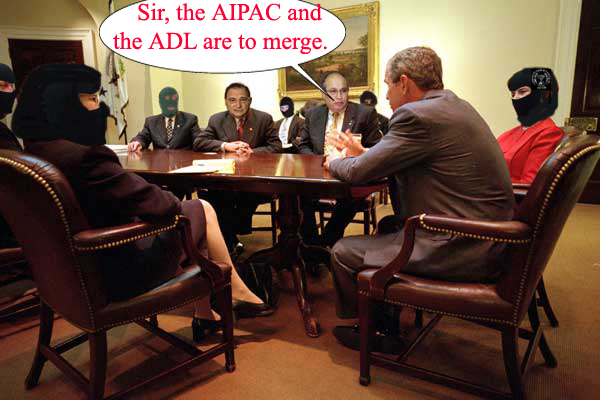 Asked about why the AIPAC executive Committee always balaclavas, Dagan said, "It was because they feared a backlash due to interference in and manulipation of US foeign policy."